Our friends and neighbors who are also ultra-prolific gardeners went away on a trip and gave us a load of tomatoes before their departure. Some were big, heavy, and seemed very juicy, others were on a smallish side. I wanted to do something special with our gift, and went on a road never traveled before by making a grilled tomato sauce. A final touch was wilting some arugula in it. I will be traveling around this road on a regular basis from now on, this was a tasty sauce, and so simple to put together! Rub the tomatoes with a little olive oil, sprinkle salt and pepper, and place on a hot grill until the skin gets nicely charred. Turn them every few minutes to get grill marks on all sides. 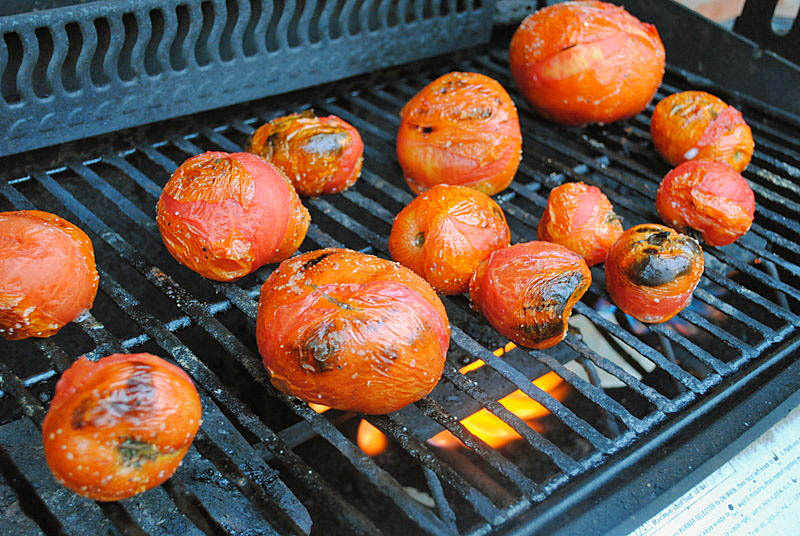 Different sizes of tomatoes will be ready at different times (obviously), so remove them from the grill accordingly. Take the stem and central core out, place the flesh, skin, and seeds in a food processor and process until smooth, or retaining some chunks, if you prefer. Saute the diced shallot in olive oil with a little salt and pepper until golden. 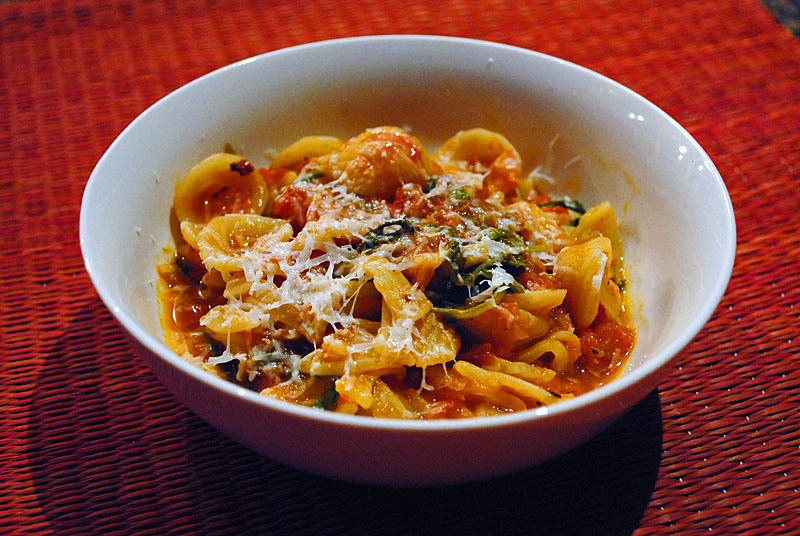 Add the processed tomatoes, and cook for 5 to 10 minutes, until it gets the consistency you like. Season with more salt and pepper if needed, and in the final couple of minutes add the arugula, cooking gently until it wilts. Meanwhile, cook the orechiette pasta according to the package instructions, drain, and mix with the sauce, warming everything together for a few minutes. Add to a serving bowl, and shave some Parmigiano on top. That’s a lovely grill you have there, I can almost smell those tomatoes sizzling and spitting 🙂 We do something similar ( no grill like yours) but roast the tomatoes in the oven before turning them into passata and even ketchup! . It definitely brings out the sweetness in the fruit. I absolutely love homemade tomato sauces. I’ve never even thought to grill the tomatoes before. I know my mom’s tomatoes are coming in like crazy now. Hopefully she’ll pass some my way and I can experiment. Great idea! I think grilling vegetables beings out the flavors. A lovely combination with the arugula. I am now very curious about making my own ketchup, I got a couple of recipes saved, and maybe grilling them first is the ticket! Mmm… these grilled tomatoes look delightful and find the perfect home in your pasta. Love the addition of arugula! I’ve grilled a few tomatoes in my time but usually just put them on the plate as a garnish and ate them right away! I tend to use roma cut in half, brush with olive oil and sprinkle on salt and pepper and whatever herbs. Grill on cut side down till marked and enjoy w/drizzle of balsamic and shaved Parmigiano Reggiano.. Never thought of doing a batch for sauce, Good Thinking! Thanx, have a wonderful trip!